Creating your own adventure scenario? Or maybe you just need a side quest or an additional roadside hazard to challenge your players. 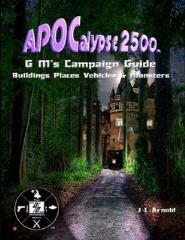 The GM’s Campaign Guide is an essential tool and reference book for the world of APOCalypse 2500. Within its pages is contained all the necessary materials game masters will need to run a successful adventure. You can use the ready-made towns and cities or you can mix and match the different buildings and locations to create your own cities. You can choose from lists of NPC's and monsters or all new vehicles and weapons to add to your adventure. Whether you need a whole town or just a single structure you will find what you need for game play. From maps to labyrinths to a complete bestiary you will find it in this volume. This is the first and primary resource for generating encounters, creating locations, and understanding the beasts that inhabit the chaotic and fascinating world of APOCalypse 2500.